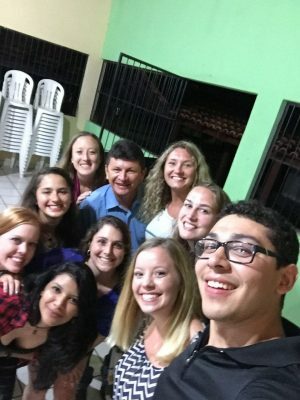 Last month, Rudy Sanchez, along with 8 other students from West Virginia University, spent 26 days in Brazil with Amizade as part of The Multilateral Partnership for Interprofessional Exchange (MPIE). Rudy shared his reflection on the experience below. No matter how much I was able to research about Brazil on the internet and from what I learned from other people who visited the country, it couldn’t prepare me for the experience I encountered over the 26 days we spent in northern Brazil. As I look back at our experience I was astounded at everything we were able to see and be a part of while in the country. We traveled miles and miles in the Kombi, traveled the Amazon river in a boat and by foot around the city of Santarèm. I think at the end when I look back I can appreciate how much I was able to learn not just about the healthcare system of the country but also about the people and the different way of life in Brazil. All of this experience was very new for me personally as the only other time I have been out of the United States was when my family took a trip to Niagara Falls, Canada when I was 15 and we only stayed for 2 days. I was both excited and nervous for this trip to Brazil. I was very excited to see a different country, as I get excited for anything new and different than what I see and experience every day. I was also excited about learning about a different healthcare system to see what good ideas I could bring back to further improve my future practice as a budding pediatrician. I was also nervous for the fact that I have never been out of the country for more than 2 days let alone going to another hemisphere of the globe for the month that I signed up for, which was a big step for me. I was also nervous about the people I was going to meet. The only person we met before our trip was Laìs at our pre-trip meeting and even though she was awesome from the beginning you still feel a little nervous about the unknown. However, looking back on this month I have met people whom I am sure will be my life long friends. I couldn’t ask for anything more than how accepting everyone was with taking in foreign students to show us everything about healthcare and the culture. One thing that I learned before anything else occurred as I hopped off the plane in Santarèm was that I needed to get used to the heat. Immediately coming off of the plane I was wearing my West Virginia University sweatshirt, since the air conditioned plane was so cold. I realized this would not be a good idea anymore with the heat and humidity. The only other time I wore that sweatshirt was on the Quilombo boat trip and that was to keep mosquitoes off of me. I also quickly learned the “Brazilian way” about showers after the first few days. I have been to Houston, Texas to visit family a couple of times which can be about 100 degrees F and 90-95% humidity but the Brazilian heat and humidity was much different. I found myself taking 2-3 showers a day because of how much I would sweat. By the end of the month I was a professional at taking quick showers throughout the day. Another thing that I found interesting were the lack of street signs. One of the first few days in the city I met a guy outside one of the banks and bought a map of the city from him. This map had all the street names so I figured I could easily find my way around. However, as we drove around in the Kombi I realized that there were no street signs. I had to ask our intern, Sara, how people find their way around the city. She had told me that everyone just remembers landmarks. So I spent the rest of the month memorizing different landmarks throughout the city when I would take runs through the city or while riding in the Kombi. Running was also one of my favorite things to do in the city, even though I have never run through a city with that much humidity. Running is what I really like to do in a new city to figure my way around and it is really good exercise. My favorite path to run was up Tapajos Avenue along the Riverfront of the Tapajos river at night. One reason the night runs were nice is because you didn’t have to deal with the hot sun beating you down and it was interesting to see how many people would be out and about after the sun went down. One aspect of our trip that was extremely helpful to our experience was Dally Anne and the Portuguese she would teach us on most of the weekdays we were there. I came to Brazil knowing only the few Brazilian phrases I had looked up a week before leaving the USA. At the end of the trip I felt that I had learned so much! I was able to go about town by myself and ask for directions and hold pretty decent conversations with local people. Dally Anne was a huge part of the Portuguese that we learned but also anyone we encountered taught us a great deal as well. As most people we met throughout our time did not speak English it was difficult to communicate. However, everyone was so excited to meet us and share any information they could, they would continue to try and speak to us in Portuguese. It would have been so easy to get frustrated and give up trying to communicate with us. But I talked with so many willing people from the security guards and cooks at APAE and the local people throughout the city and in communities on the Quilombo trip. Everyone we encountered played an important role in the Portuguese we learned. I have also brought up some Portuguese words and incorporated into my speech here. One of the biggest highlights of our trip was definitely being able to participate and travel along with the Quilombo trip. This trip opened my eyes and I learned so much that will not only help me in my professional career as a pediatrician but I learned so much about people and culture of Brazil outside of a city. The first day on the boat was all travel to the first community, Tapagem. It was an interesting 26 hours as our boat engine died twice which left us stranded in the Amazon river for a little bit but our crew was able to remedy that problem. It was interesting to see the remote houses that were along the river where the entire family lived. I spent a lot of time thinking on this trip about the people in these remote areas. For instance, how big of a trip it would be if they needed to go to the city and just how their daily lives were without cars and only able to get around on boat. We ended up arriving about 11:30am in Tapagem with the clinic day about halfway over. However, everyone was quick to involve us right away even allowing one of us remove a child’s wart within minutes of arriving. Our transition into the project was pretty seamless especially for showing up late on the first day. I spent my time with the doctor, Dr. Renann Keiji, since being a medical student that seemed like the most relevant place to be. Dr. Keiji was great at telling us what he was doing and why and included us very much into the patient’s care. His English was also excellent which really helped with the amount I could learn about the patients. The first day came to an end and I was amazed how efficiently the mobile clinic was packed up and put back onto the boat. We left Tapagem and headed to our next destination, Curuçá. We arrived in Curuçá a little after dinner time that same day and docked our ship close to the community. I found out how different it was to sleep on the boat when it is not moving. I couldn’t sleep in the hammock as I found out the first night so I tried to go sleep in the extra room on the ship. However, without a fan and the boat stopped this room was about 90 degrees F. I sweated through my clothes that night and finally fell asleep around 4am. 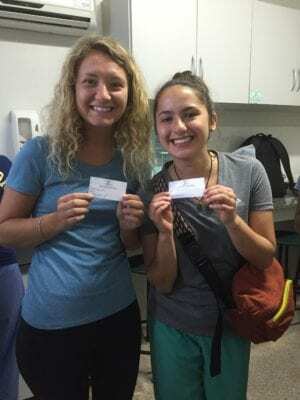 We woke up the next day to set up clinic in the community and I was again amazed of how efficiently the clinic was set up as we didn’t get to see that the day before. This day I learned about how most of the patients were there at the clinic to follow up with their diabetes and hypertension and to receive their medications for these health problems. It was also interesting to see how many people showed up to clinic complaining about pain just wanting some Ibuprofen or Paracematol. Which is something I didn’t think about people coming to a clinic for since it is so readily available at your local pharmacy here in the US. But I had to remember that people in these communities don’t have access to a local pharmacy. Throughout the day I could see the rapport that Dr. Keiji had established with his patients and you could see that they trusted him. He explained to us how a lot of these patients did not want to take their medications but it was because they didn’t really understand their particular diseases. So, after he would take the time to explain it to the patient they were more willing to be compliant with taking their medications. So another day came to an end and we packed up everything and put it back on the boat then headed out for our next destination, Moura. We arrived in Moura later in the afternoon and docked near the community. And this brought with it another motionless, hot night. We woke up the next day to set up clinic again in Moura. This site was a little different as it was in a building that mostly one big room with a few small rooms near the back where the patient rooms were set up. This building seemed to be the largest one yet and it was also filled with people. At this point Dr. Keiji was really getting us involved even having us write out some prescriptions in Portuguese, which also helped out my learning of the language. Another interesting thing I learned on this day was the way Dr. Keiji had to think about the best way of diagnosing patients and treating them. For instance in some cases the treatment he would prescribe would also prove the diagnosis. I realized he had to do this because we were only there for the day we could not order tests and then come back a few days later with medication. I also didn’t think about if a patient needed any imaging studies like X-ray, MRI, or ultrasound it was not something that could be done that day or even that week. We had to write a prescription for the study and then the patient had to figure out a way to make it to the city in order to get the imaging study done. This made me realize that we had to be diligent about which patients really needed imaging. This is something we don’t think much about here because imagining services are so readily available that sometimes patients who don’t really need the study still get it. This idea is something that I will need to incorporate more into my training so my patients are getting imaging that they only really need. With the last clinic day coming to end we had to pack everything up and put it on the boat. Something stuck out to me this time though, there were a lot of men from the community helping us carry stuff back to the boat even some of them were the patients from the day. I really appreciated the help that these people were ready to give, this aspect of teamwork is essential in the healthcare field. We left the shore and waved bye to Moura and headed back on our way to Santarém. I learned so much on this Quilombo trip that I will take with me to my future practice. Looking back and thinking about this trip to Brazil I don’t think I can thank everyone who had helped us along the way but we all really appreciate everyone who took time out of their day to teach us about Brazilian culture, Brazilian healthcare, and all the Portuguese we learned. This trip helped to expand what I look at when treating a patient, as there is more than just disease. After interacting with all the wonderful people in Brazil I feel that I have grown myself and reach out more than I have to students or anyone who is from a new country because I know how welcoming it felt when everyone was so willing to talk and help me in any way possible. There are so many things I learned during the month I spent in Brazil that I will continue to use to progress not only as a future pediatrician but also as a person. I just hope that I was able to help at least one person learn a new or interesting concept that they can use to better themselves as a person in the future. How amazing is seeing this experience through the student perspective. I am grateful for Rudy’s words and for everyone who helped us make this trip possible.